After some retail therapy between Harrods and Harvey Nichols pop into this homely, traditional Lebanese eatery in the heart of Knightsbridge serving authentic Lebanese cuisine. The restaurant is relaxed and casual, and the atmosphere is lively - especially when the curvy belly dancer takes to the floor. 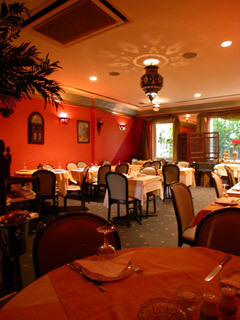 Named after the Rawsha area of Beirut this homely restaurant has two dinning areas. Dressed tables and ambient lighting set the scene for a lovely relaxed meal or just some drinks accompanied by a shisha. The rear dinning room provides a quieter and more intimate surrounding. Belly dancers and live music is available on some nights. Service is relaxed and courteous. After your meal relax and enjoy a little shisha. Party bookings, business lunches, dinners and company bookings are welcomed here. The restaurant can also provide outside catering where necessary. A takeaway and delivery service is also available. 10% Discount when you book online! The menu consists of a Middle Eastern feast, with a vast array of mezze, main courses and daily specials that are beautifully prepared and presented. Incidentally the choice for vegetarians is excellent with over 20 starters dedicated to them. All meat served here is Halal.